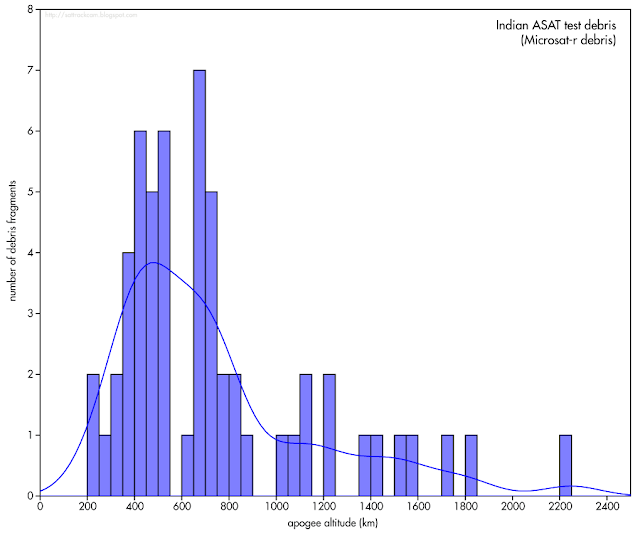 In my previous two posts (here and here), I analysed the much discussed Anti-Satellite (ASAT) test by India taking out Microsat-r on 27 March 2019. Now the story gets a new twist. 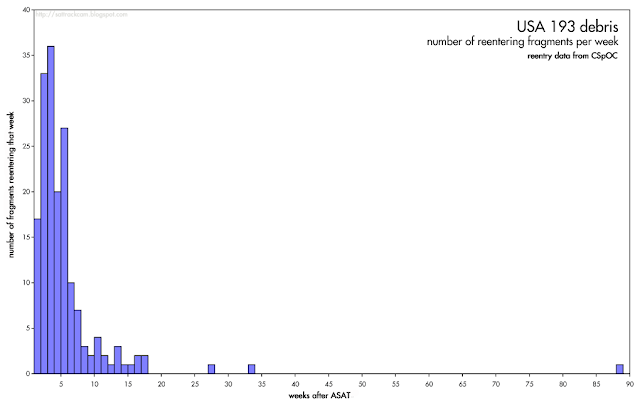 Yesterday, Ankit Panda had a scoop in The Diplomat: it turns out that India attempted an ASAT intercept earlier, on February 12, 2019, which ostensibly failed according to US government sources. 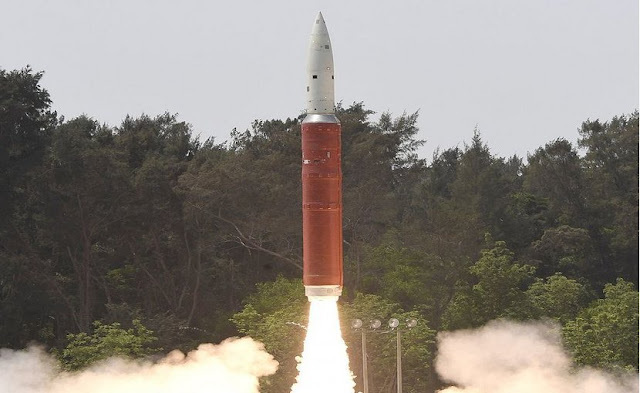 Ankit is well sourced within the US Government, and his sources told him that a missile launch was observed on February 12th, which reportedly failed 30 seconds after lift-off. A NOTAM and Area Warning had been given out for that day by the Indian government, for the "launch of an experimental flight vehicle" (the latter detail mentioned in the NOTAM but not the Maritime Area Warning). 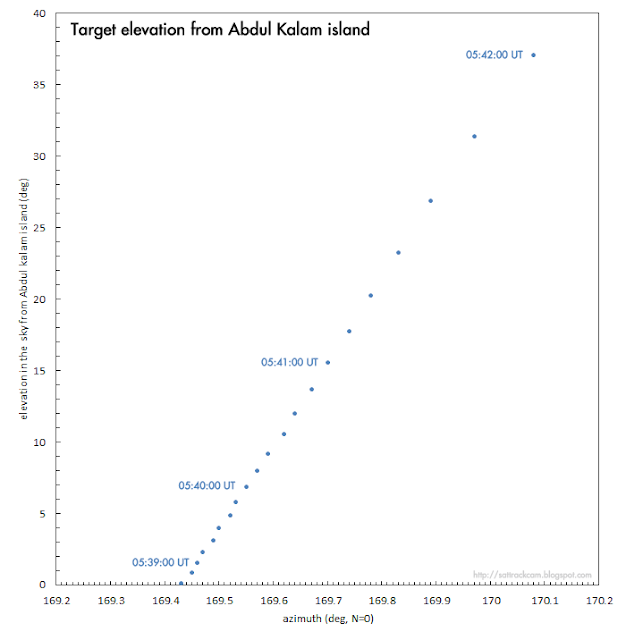 The Indian Government later published a bulletin omitting any reference to a missile failure, instead suggesting the succesful test of an "interceptor missile", launched from Abdul Kalam island, against an "electronic target". 2. CANCEL THIS MSG 140745Z FEB 19. 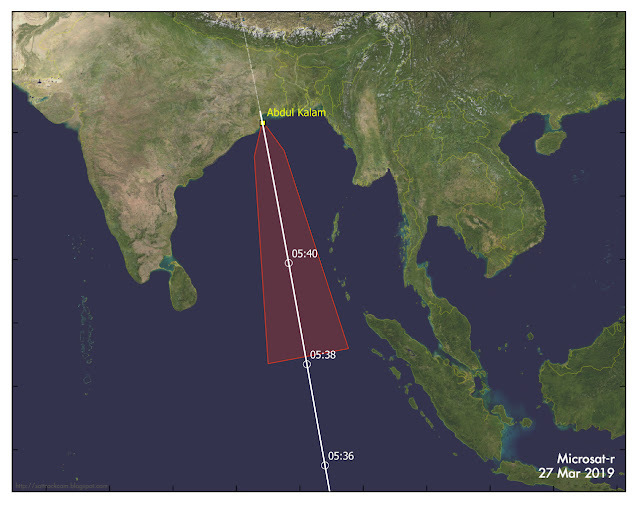 March 27 Area Warning and Microsat-r track. The hazard areas are virtually indistinguishable, and so is the location of the Microsat-r ground track. 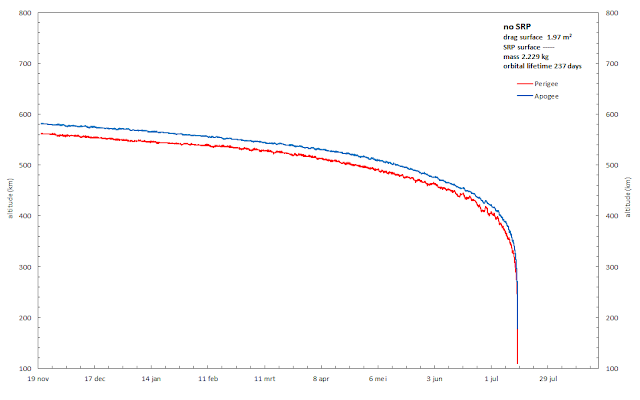 Microsat-r clearly was the target ("electronic" or not) of the February 12 attempt as well. Even the pass times are close for both dates: compared to March 27, the Microsat-r pass over Abdul Kalam happend about 1 minute earlier on Feb 12. With the benefit of hindsight, it is all very clear. Indeed, press reports based on the mentioned Indian Government bulletin give 11:10 am Indian Standard Time (05:40 UT) as the time for the Feb 12 attempt. From the listed time, we can deduce that the virtual intercept would have happend at 271 km altitude, some 12 km lower than the 283 km altitude of the succesful March 27 intercept. 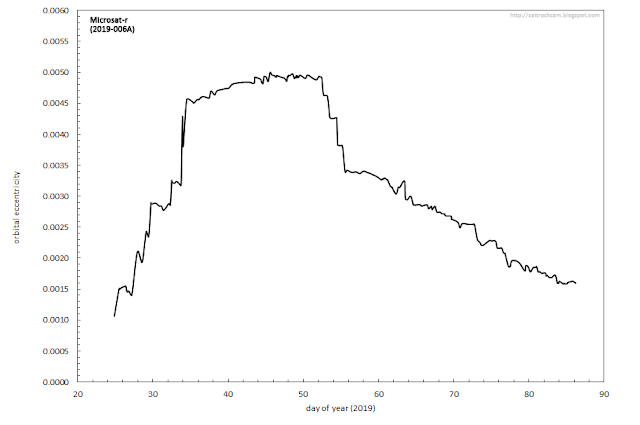 Microsat-r was in a slightly different orbit on February 12th: a slightly more eccentric, but stable 240 x 300 km orbit. 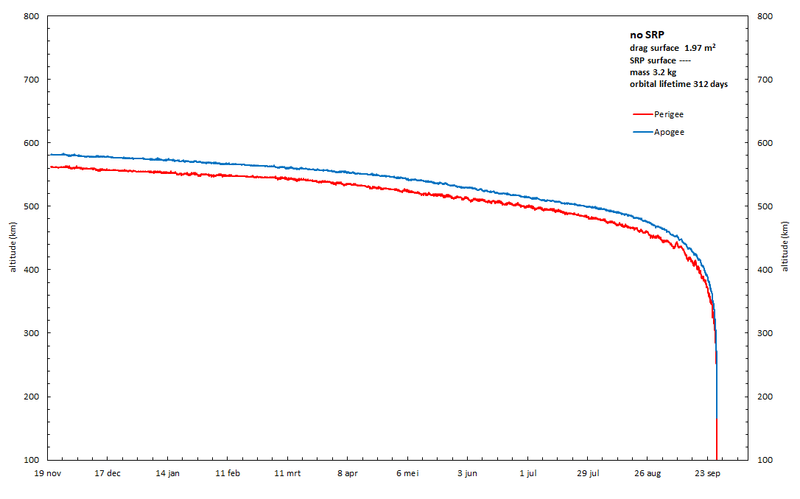 During the succesful ASAT test of March 27, Microsat-r was in a slightly more circular 260 x 285 km orbit. 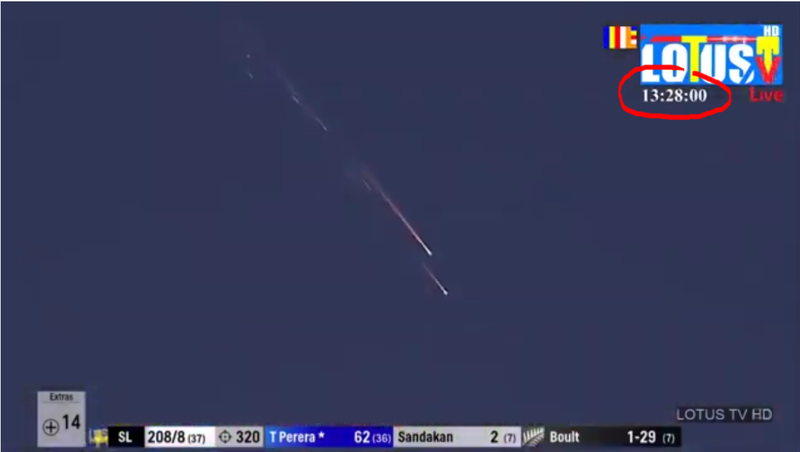 An open question is whether the February 12 attempt was a rehearsal and not a real attempt to hit and kill the satellite; or if it was a real attempt but failed. If Ankit Panda's US government sources are correct that the missile failed 30 seconds after lift-off, it would seem a failure, unless the cut-off after 30 seconds was intentional. Another open question is whether the US government was aware on February 12 that it was an ASAT test (see also this Twitter thread by Brian Weeden). With the February 12th attempt so soon after launch of Microsat-r (January 24th), it would appear that Microsat-r was specifically launched to function as an ASAT target. Debris from India's ASAT test: how long until it is gone? 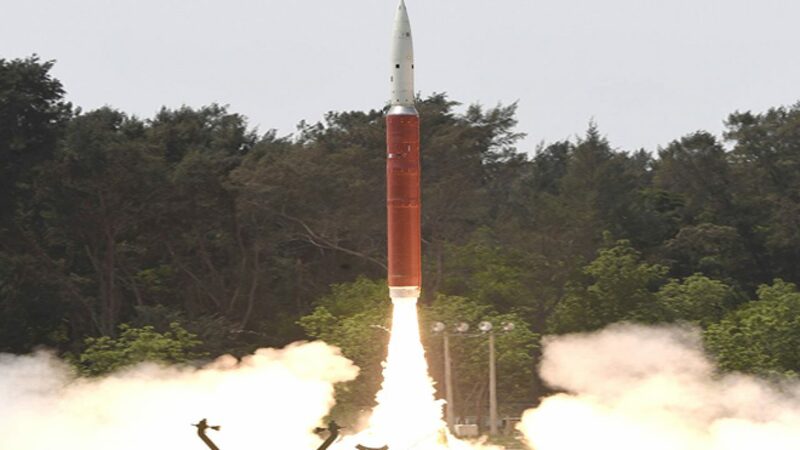 After India's ASAT test on 27 March 2019, on which I wrote in detail in my previous post, many people asked the obvious question related to the debris threat from this test: how long would debris pieces stay on-orbit? At the moment of writing (late 31 March 2019), no orbits for debris pieces have been published yet, although CSpOC has said they are tracking some 250 pieces of debris currently. Some insight into the possible lifetimes of debris fragments can however be gleaned from the debris generated by "Operation Burnt Frost", the destruction with an SM-3 missile of the malfunctioned USA 193 satellite by the United States of America on 21 February 2008. 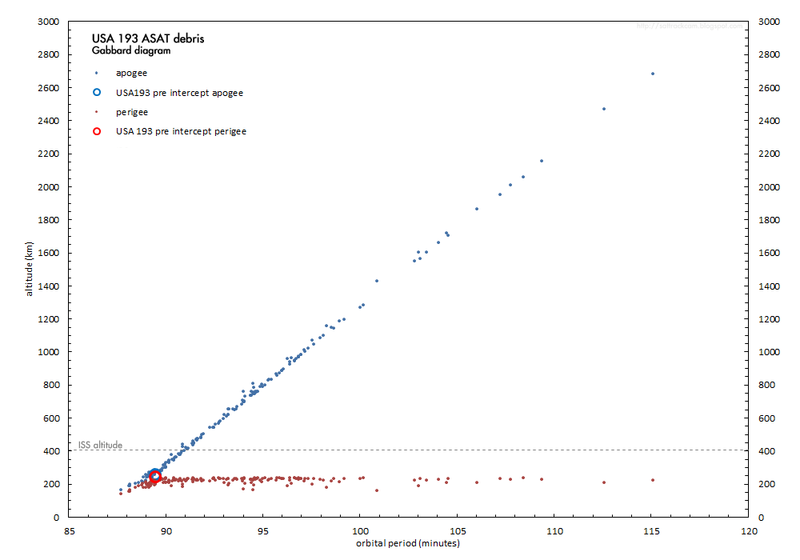 The USA 193 ASAT demonstration in 2008 provides a reasonably good analogue for the Indian ASAT test on Microsat-r on March 27. 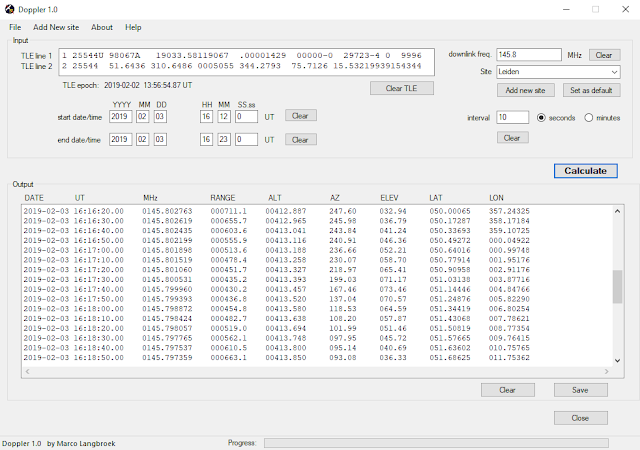 The orbital altitudes are somewhat comparable: USA 193 moved in a ~245 x 255 km orbit and was intercepted at ~247 km altitude. 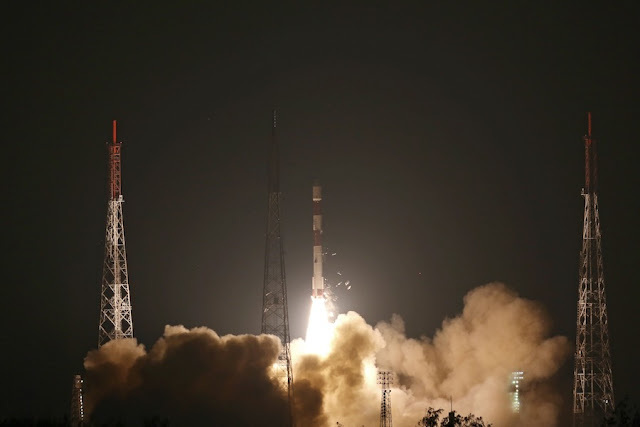 Microsat-r moved in a ~260 x 285 km orbit and was intercepted at 283 km altitude, i.e. a difference of ~36 km in altitude compared to USA 193. Both intercepts happened in years with low solar activity, i.e. similar upper atmospheric conditions. 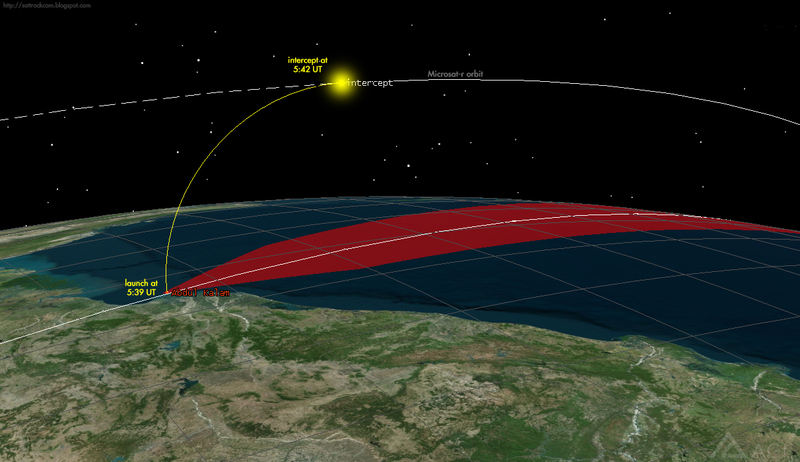 There are some differences too: USA 193 was intercepted near perigee of its orbit, Microsat-r near apogee. 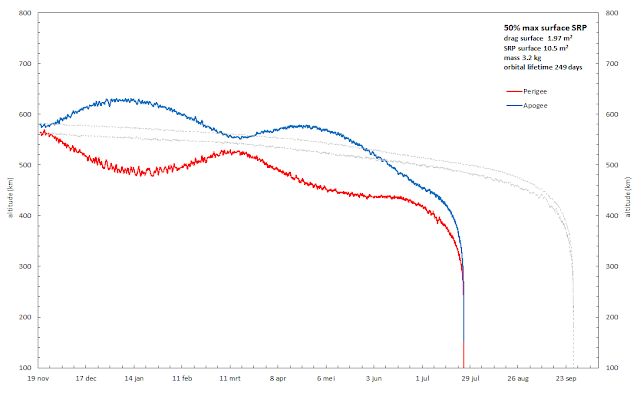 There is a difference in orbital inclination as well: 58.5 degrees for USA 193, and a 96.6 degree inclined polar orbit for Microsat-r. Nevertheless, the USA 193 intercept is a good analogue: much more so than the Chinese Fengyun-1C ASAT in 2007, which was at a much higher altitude and yielded much longer lived debris fragments as a result. The distribution of reentry dates shows that most fragments reentered within two months, with a peak about 3 weeks after the destruction of USA 193. Almost all of it was gone within half a year. Yet, a few fragments ejected into higher orbits had much longer orbital lifetimes, up to almost two years. 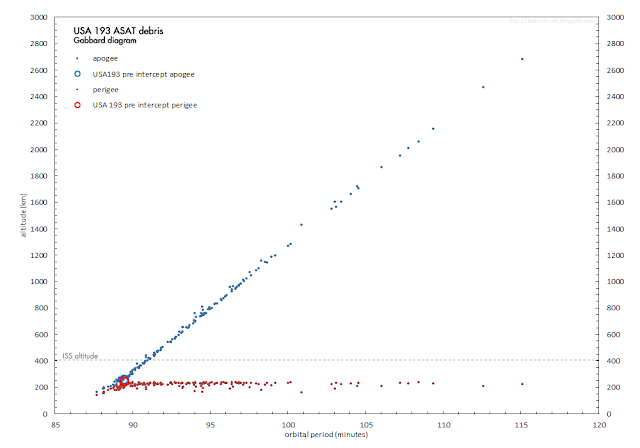 This shows that even low altitude ASAT tests on objects in Earth orbit do create at least a few fragments with longer orbital lifetimes. The 174 debris fragments in question constitute a subset of larger, well-tracked particles within the USA 193 debris population. 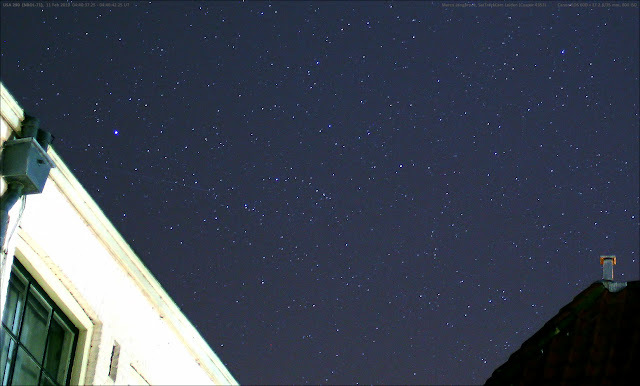 There were thousands more fragments, most very small, that were not (well) detected. Most of these likely reentered within hours to a few days after the destruction of USA 193, given that small fragments have a large area-to-mass ratio (meaning their orbits decay faster, as they are more sensitive to drag). Given the similarities, we can expect a similar pattern as the diagram above for debris fragments from the Indian ASAT test. As the Indian intercept occured slightly (about 35 km) higher, fragments might perhaps last a little bit - but probably not that much - longer. 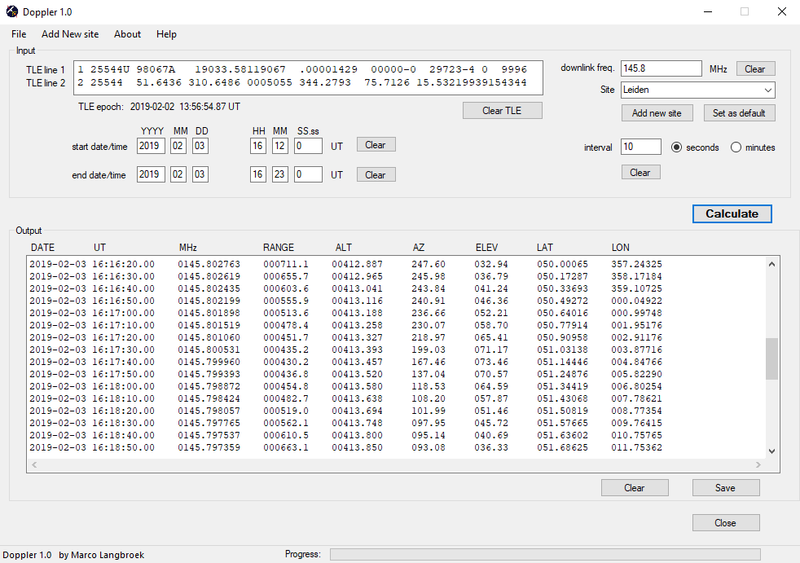 A follow-on post with an analysis or orbital altitudes of generated debris can be read here. Late February 2019, a number of news outlets (e.g. here and here) copied a story that originally appeared on Space.com, titled: "Failed 1970s Venus Probe Could Crash to Earth This Year". It concerned an unusual object launched 47 years ago, called the Kosmos 482 Descent Craft (1972-023E, CSpOC nr 6073). Word was that it was about to reenter into the atmosphere, maybe even this year. But will it? Short answer: almost certainly not. The source of the prediction is attributed to Thomas Dorman in the Space.com article, but how the prediction was done is not clear from the news coverage. On the request of David Dickinson, who was preparing an article on the topic for Universe Today, I made my own assessment of the issue. 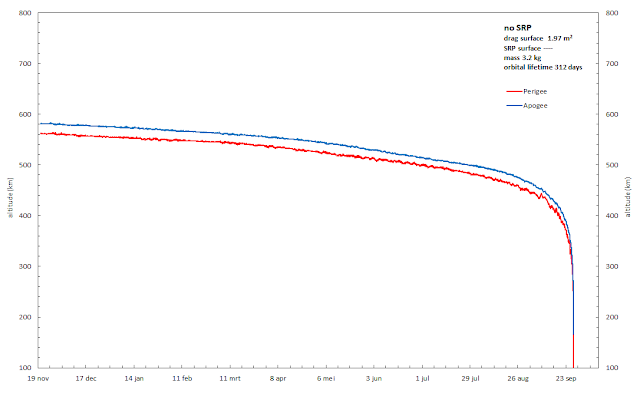 I looked at the orbital decay of 1972-023E since 1973 and did some GMAT modelling to gain insight into how the orbital decay will develop in the future. 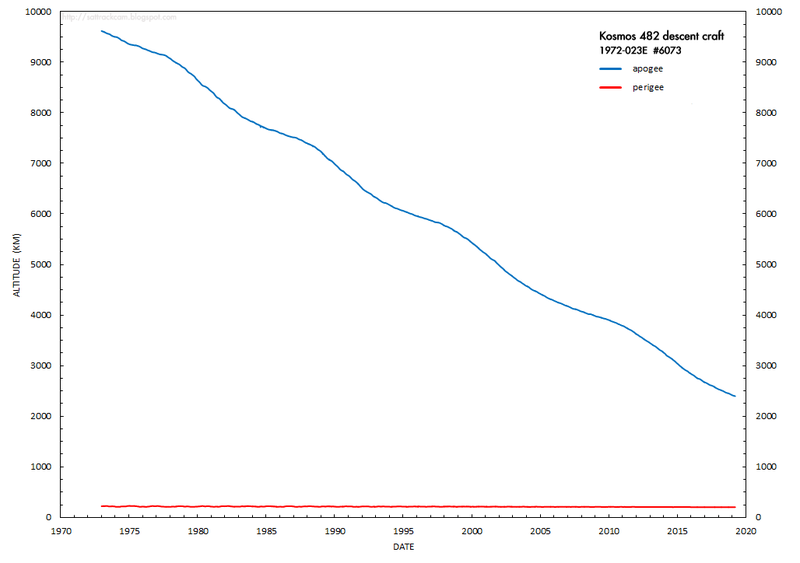 As I will show in this post, my modelling suggests the Kosmos 482 Descent Craft is not to come down yet for several years. During the 1960-ies and '70-ies, the Soviet Union launched a number of Venera space probes destined for the planet Venus. Some of these probes did reach Venus and even briefly took pictures before succumbing to the very hostile atmospheric environment on this planet. But not all of the probes reached Venus. Several attempts went awry. 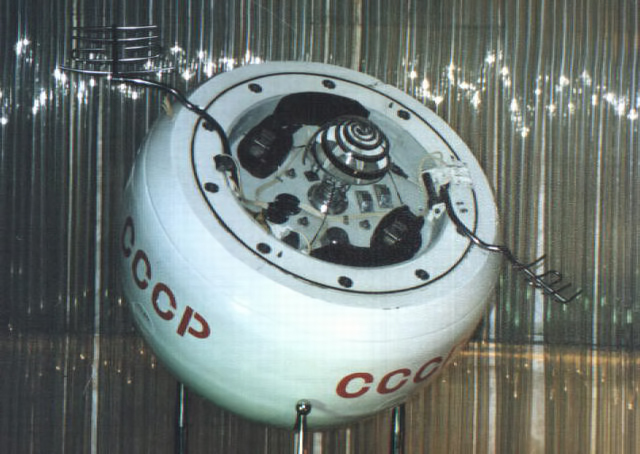 Kosmos 482, a probe similar to and launched only a few days after the Venera 8 probe, was launched from Baikonur on 31 March 1972. 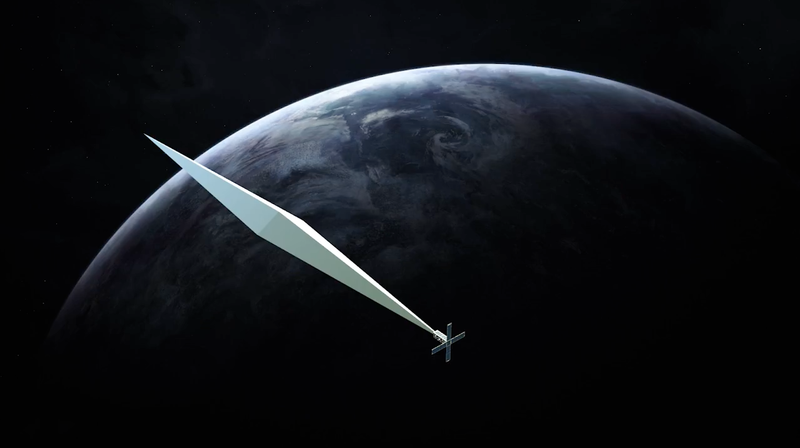 Reaching a highly elliptic parking orbit around Earth, its apogee kick motor failed to put it into an heliocentric orbit. The space probe broke up into at least four pieces that remained in Low Earth Orbit. Two of these, parts of the rocket engine, reentered within weeks of the failure. Another piece, presumably the main space probe bus, reentered in 1981. A fourth piece, 1972-023E, is left on orbit, and it is interesting, as it most likely concerns the Descent Craft, the lander module in its protective cover that was to land on Venus, similar to the Venera lander module imaged in the photograph in the top of this post. 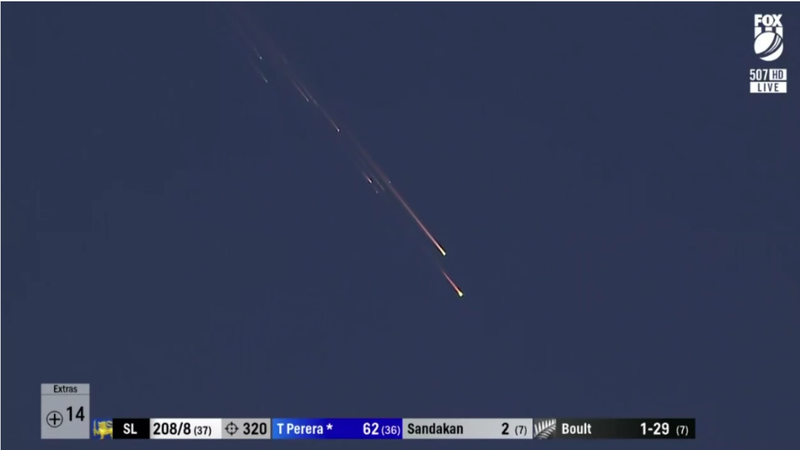 That makes this a highly interesting object, as it will likely survive reentry into the atmosphere (it was designed to survive reentry into Venus' atmosphere after all). 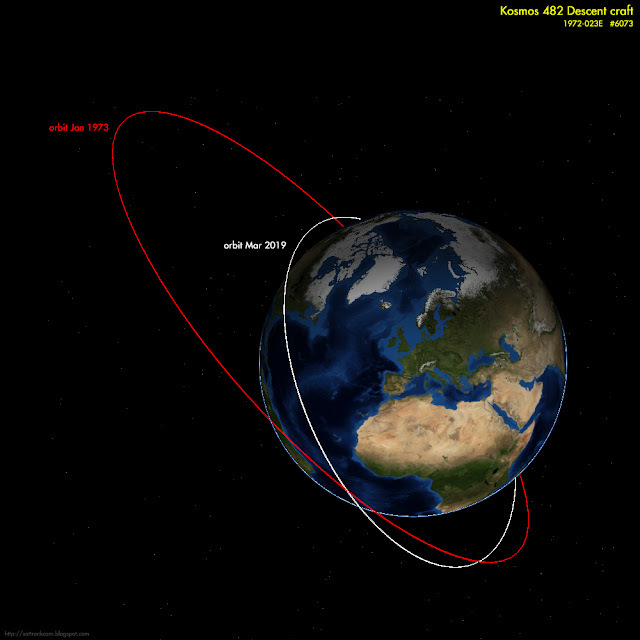 The diagram below shows how the apogee and perigee changed between January 1973 and March 2019. The orbit has become markedly less eccentric. 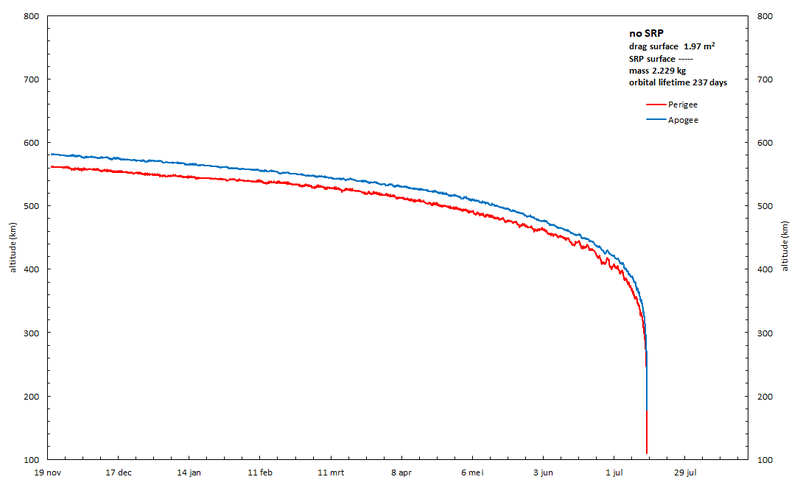 Orbital decay strongly acted on the apogee altitude. 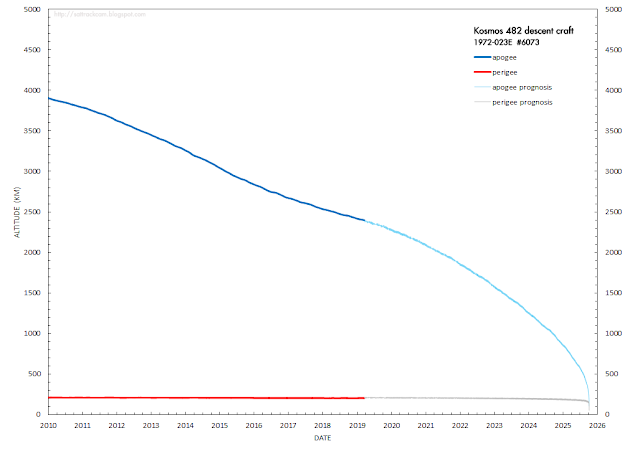 The apogee altitude (blue line in the diagram) has come down steadily and by a large amount, from ~9600 km to 2397 km.This lowering of the apogee is to continue over the coming years. 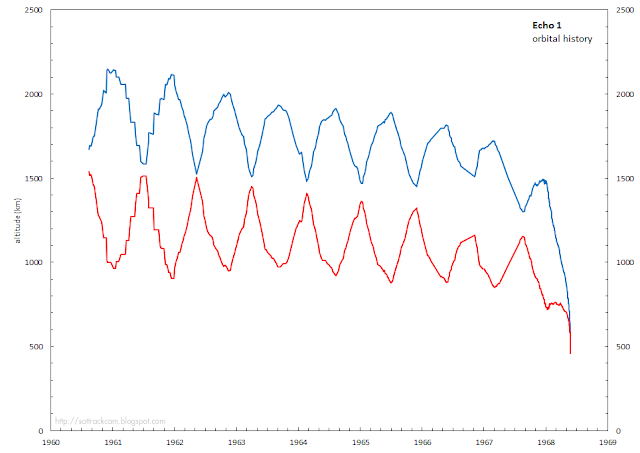 By contrast, the perigee altitude (red line) has changed only minimally, from 210 to 202 km over the past 46 years. 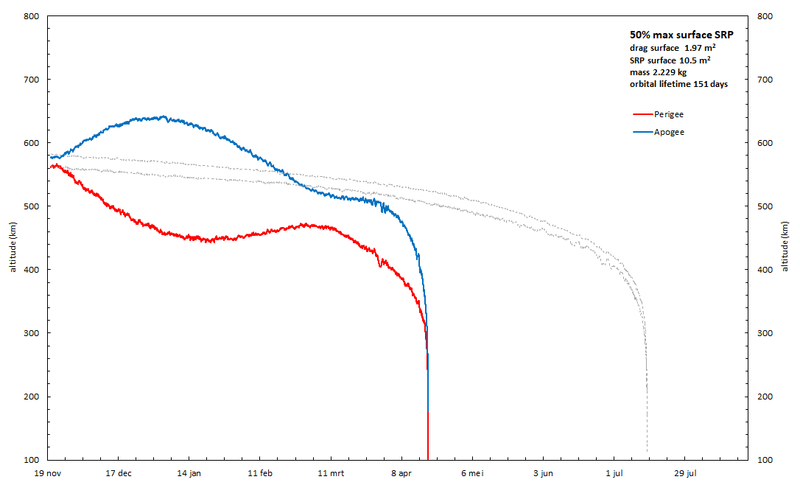 The apogee altitude will continue to come down. 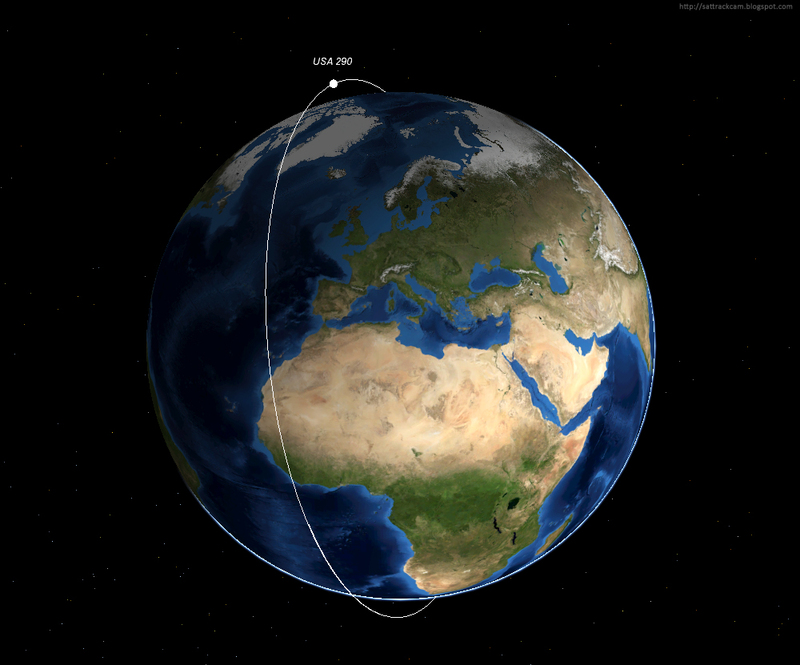 Once it is below ~1000 km, in combination with the low perigee at ~200 km. decay will go progressively fast. To gain insight into the validity of the claim that object 1972-023E might reenter this year, I modelled the future decay of the orbit using General Mission Analysis Tool (GMAT) software. 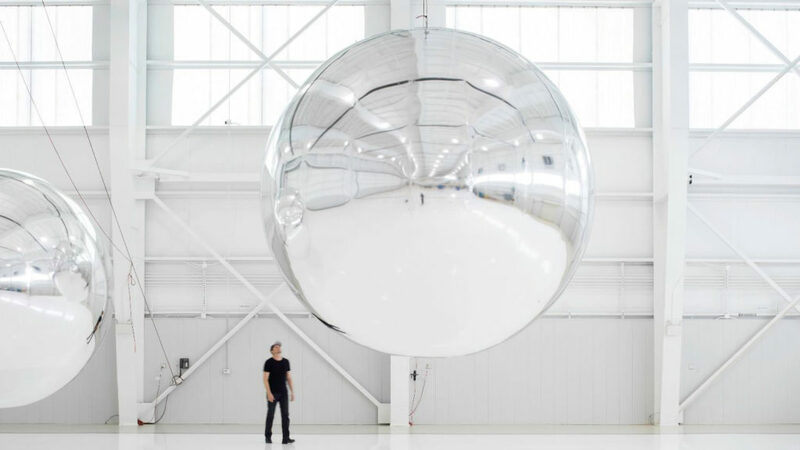 Modelling was done for a 495 kg semi-spherical lander module 1 meter in size, using the MSISE90 model atmosphere. 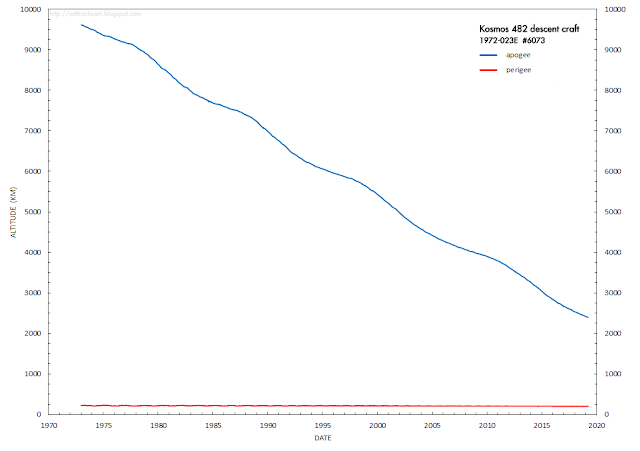 The result suggests that the Kosmos 482 Descent Craft still has at least 5 to 7 years left on orbit. My model has it nominally reenter late 2025. Taking into account the uncertainties, a reentry between late 2024 and late 2026 seems most likely. That is still several years away. The model result fits well with the trend in the actual tracking data, which gives confidence in the results (the thick lines in the diagrams above are actual tracking data, the thinner lines the GMAT modelled future orbital decay. The latter extend the previous trend in the tracking data well, there are no clear pattern breaks). It should be well noted that modelling the decay of highly elliptic orbits with high apogee and low perigee is notoriously difficult. Yet, both the past and current orbital parameters and my modelling forecast do lead me to think a reentry is not imminent. 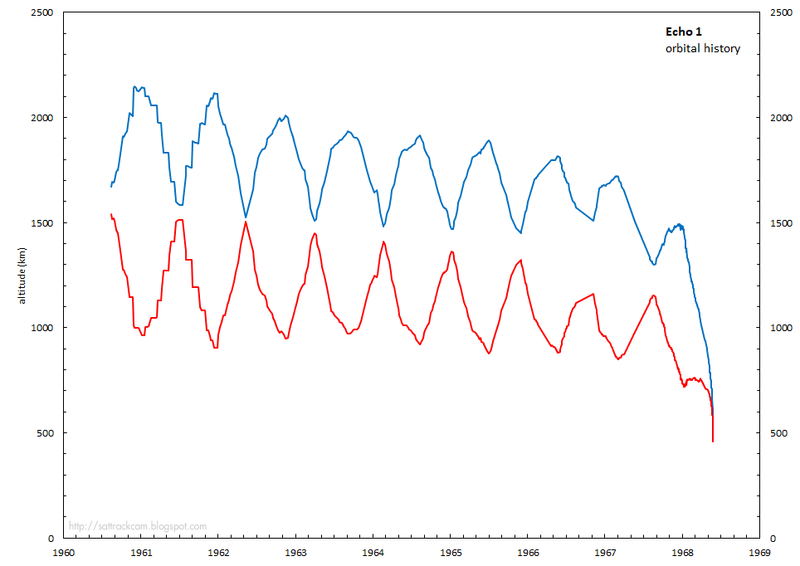 I am not the only one casting some doubt on a reentry of 1972-023E this year. 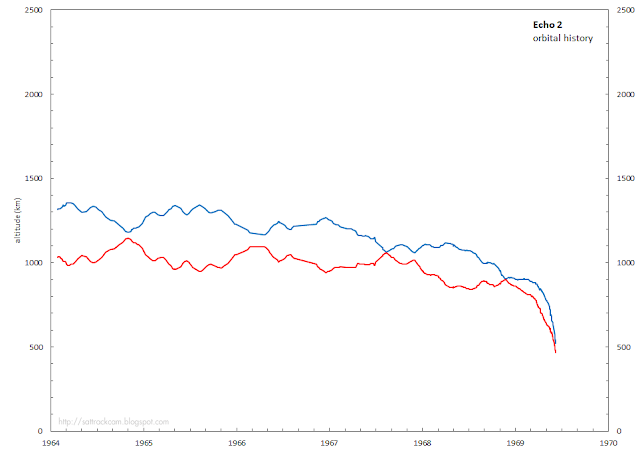 Both NBCnews and Newsweek quote earlier results by Pavel Shubin that predict reentry around 2025-2026, quite similar to my results. They also quote well-known and respected space analyst Jonathan McDowell who is similarly opting for a reentry several years into the future, rather than the coming year. 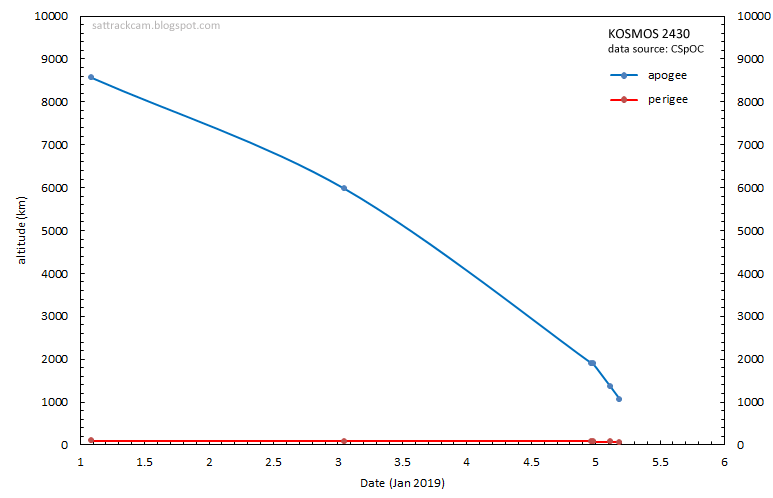 From my look at the current orbital decay rate and my modelling of future orbital decay, supported by assessments from other sources, it appears that the newsreports suggesting that the reentry of the Kosmos 482 descent craft is imminent and might even occur this year, are in error. As to the why of the discrepancy: in the Space.com article, Dorman is quoted claiming "Our guess is maybe as much as 40 to 50 percent of the upper spacecraft bus may still be there". It is not clear at all what this "guess" is based on. My own modelling shows that the mass and size of the landing module only (i.e. without other parts still attached), fits the current orbital decay rather well. 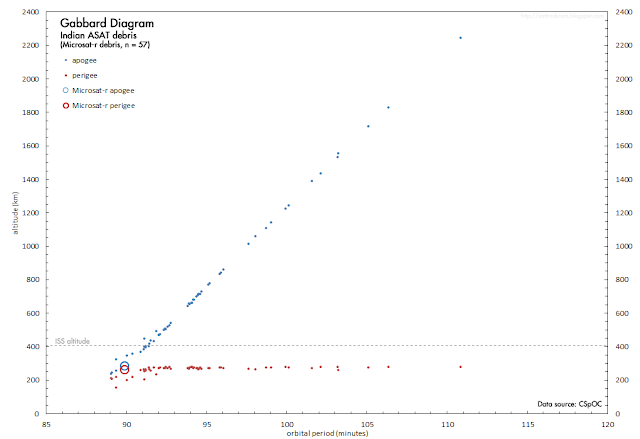 It is not clear how Thomas reached his conclusion, but modelling with a wrong mass and/or size might explain the discrepancy between my result and that claimed in the Space.com article. I am hesitant with regard to accepting the high resolution imaging attempts by Ralph Vandebergh featuring in the Space.com article as evidence for object 1972-023E being more than the lander module only, as the weak and rather irregular protrusions visible might be image artefacts from atmospheric unrest and camera shake rather than real structure. Even when telescopically imaged at minimal range in perigee, we are talking about apparent object sizes at the arcsecond level and single pixel level here, conditions under which it is very challenging to image detail. Under such challenging conditions, spurious image artefacts are easily introduced. Acknowledgement: I thank David Dickinson for encouraging me to probe this issue. If nothing ontowards happens, the National Reconnaissance Office (NRO) will launch NROL-71, a Delta IV-Heavy with a classified payload, from Vandenberg SLC-6 on 19 December 2018 (18 December local time). [edit:] after the December 19 launch was scrubbed, a new launch attempt will take place on December 20 (December 19 local time in the USA). The December 20 launch was scrubbed as well due to a hydrogen leak in one of the boosters. A provisional new launch date is 21 December 2018 (December 20 local time in the USA) at 1:31 UT. The new launch date will not be before 30 December 2018. The launch was postponed three times. 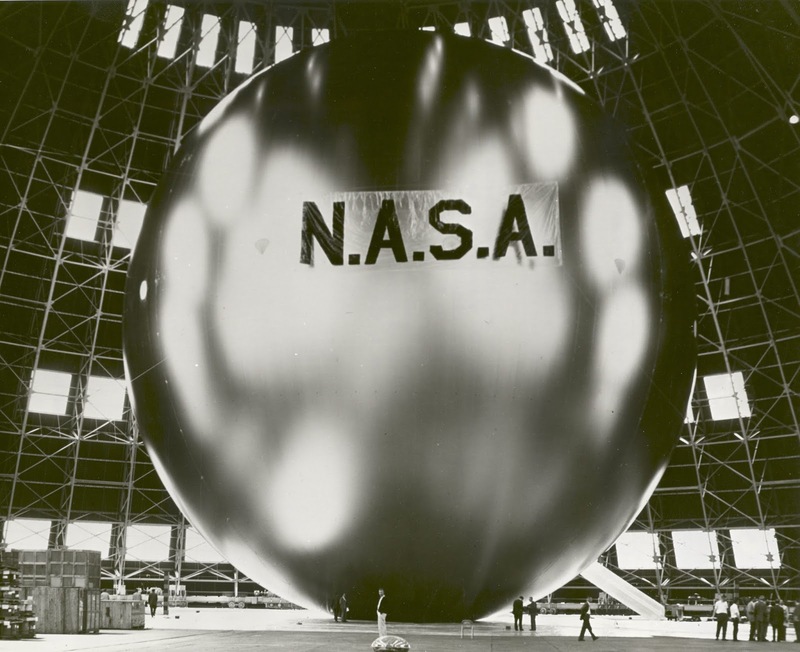 Originally to be launched on December 8, a communications problem aborted that launch. A renewed launch attempt the next day, was aborted only 7.5 seconds before lift-off because of a technical issue (see the video below). A new launch attempt will take place on 19 December 2018 at 1:57 UT. As weather prospects at the moment do not look particularly good for that date, it is possible that the launch will see even further postponement. [edit:] This assessment turned out to be right: the launch was postponed due to high altitude winds. A new launch date has been set for 20 December 2018 at 1:44 UT. The December 20 launch was also aborted, due to a hydrogen leak in one of the boosters. A provisional new launch date has been set for 21 December (20 December local time in the USA) at 1:31 UT. The new launch date will not be before 30 December 2018. NROL-71 is an odd launch. When the Maritime Broadcast Warnings for the launch came out and revealed the launch hazard areas, they contained a big surprise. The general expectation among analysts was that NROL-71 was the first of the Block V new generation KH-11 ADVANCED CRYSTAL electro-optical reconnaissance satellites. 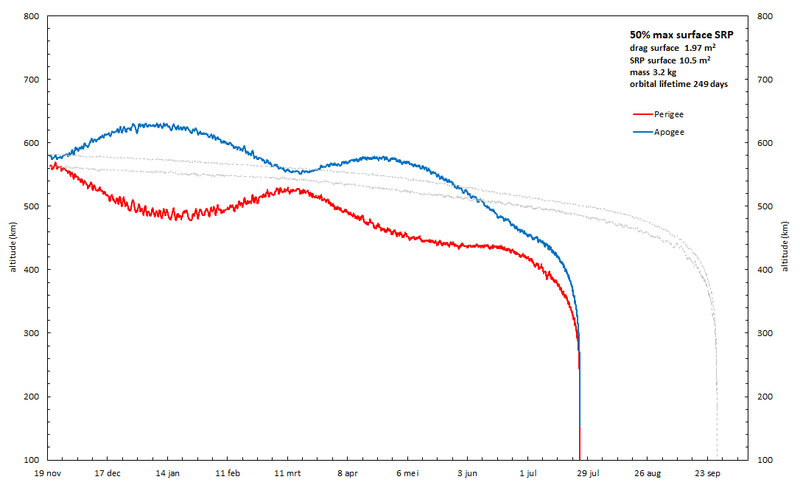 As such we expected it to go in a sun-synchronous, 97.9 degree inclined, 265 x 1000 km orbit. But the Maritime Broadcast Warnings suggest this is NOT the case. The hazard areas are incompatible with such a sun-synchronous polar orbit. Instead, they point to a (non-sunsynchronous!) 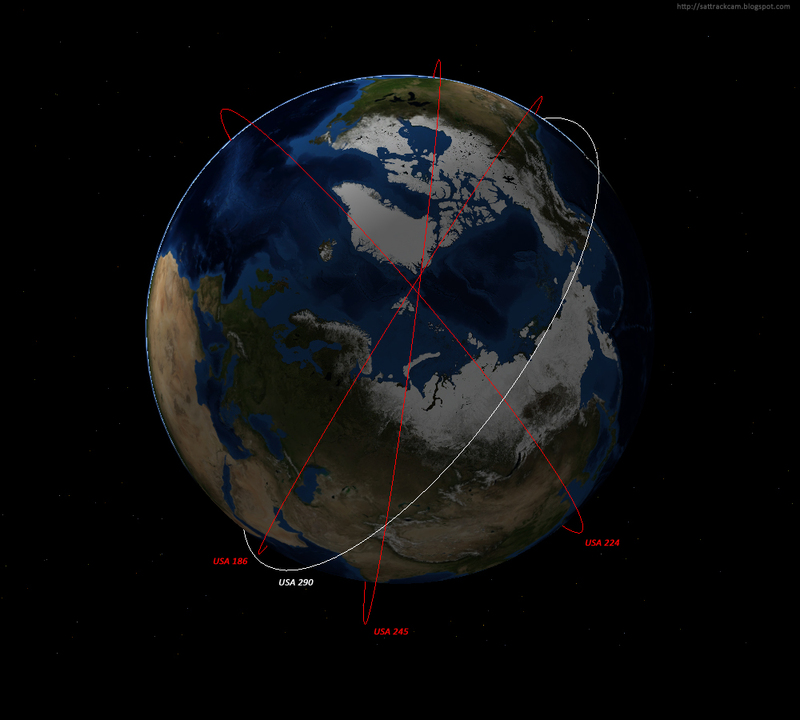 74-75 degree inclined orbit. Not what you expect for an optical reconnaissance satellite! The map below shows the three hazard zones. Two are directly downrange from the launch site, where the strap-on boosters and first stage splash down. 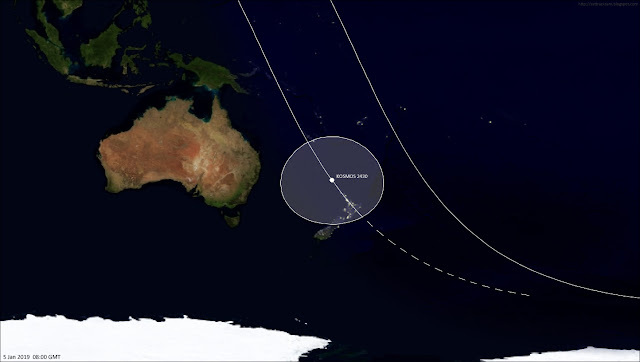 The third area is the upper stage deorbit area (which is remarkably small in size), located northeast of Hawaii, with deorbit occuring near the end of the first revolution (as usual). The trajectory depicted by the dashed line on the map is for a 74-degree inclined, 265 x 455 km orbit. 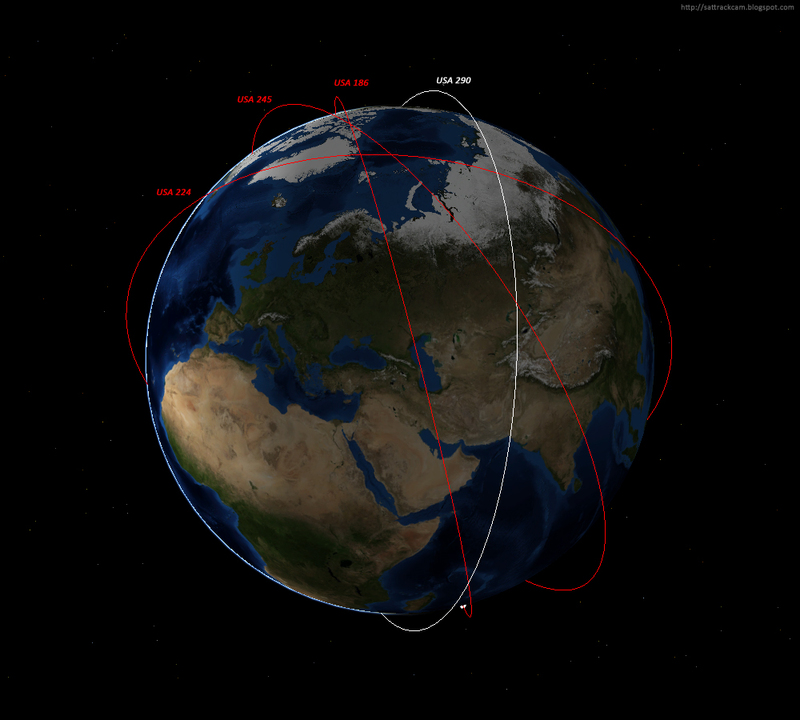 Higher inclined orbits would miss the downrange splashdown zones and the upper stage deorbit area. Ted Molczan has pointed out that the shift in launch time with each launch delay, points to a specific orbital plane and a specific aim for the rate of precession of the RAAN of -2.27 deg/day. 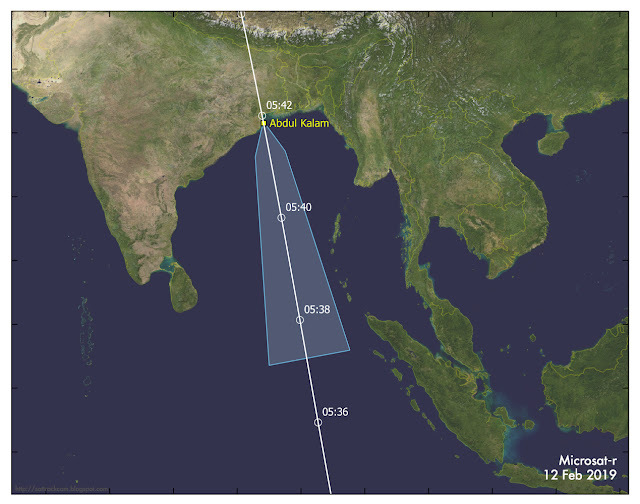 This is over twice as fast as the RAAN precession of the KH-11 currently in orbit (0.98 deg/day, i.e. sun-synchronous). 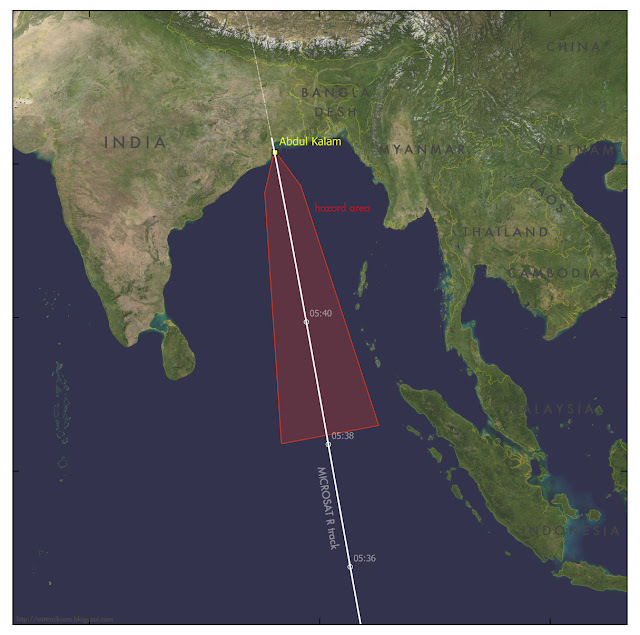 This value for the RAAN precession apparently aimed for, puts further constraints on the orbit as in combination with the 74-degree inclination deduced from the location of the Launch Hazard areas it points to a semi-major axis of about 6735 km. 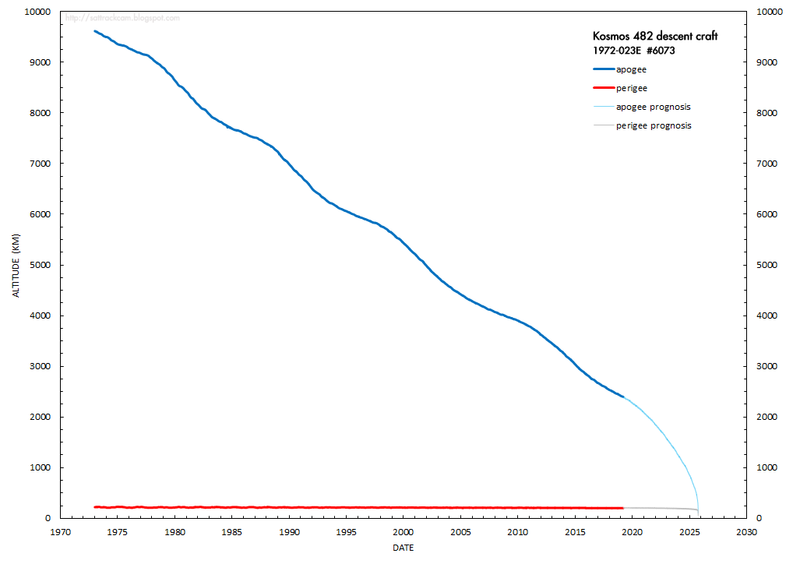 Going from the notion of KH-11-like orbital altitudes, the current typical KH-11 perigee near 265 km would then result in an apogee near 455 km. 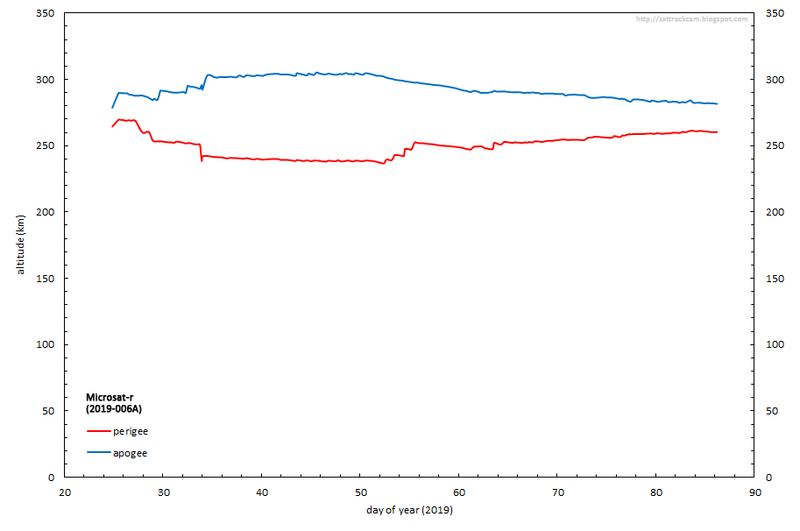 This is somewhat similar to the orbital altitude of the oldest of the KH-11 on orbit, USA 186 in the secondary West plane, which was in a 262 x 443 km orbit when we last observed it early October (it currently is invisible due to the winter blackout). 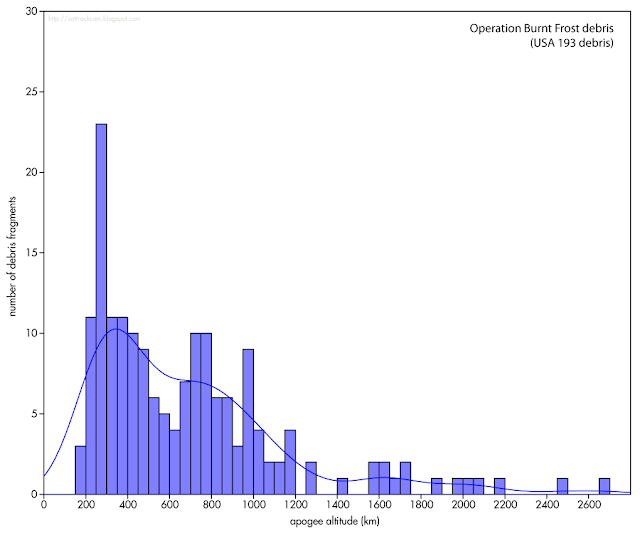 This apogee would be much lower than that of the two KH-11 payloads in the primary planes, which have apogee near 1000 km, i.e. twice as high, another deviation from expectations. Normally, KH-11 are launched into a primary plane and about 265 x 1000 km orbit, and only after some years, when the payload is moved to a secondary plane (and a new payload is launched into the primary plane), is apogee lowered to ~450 km (see an earlier post here). 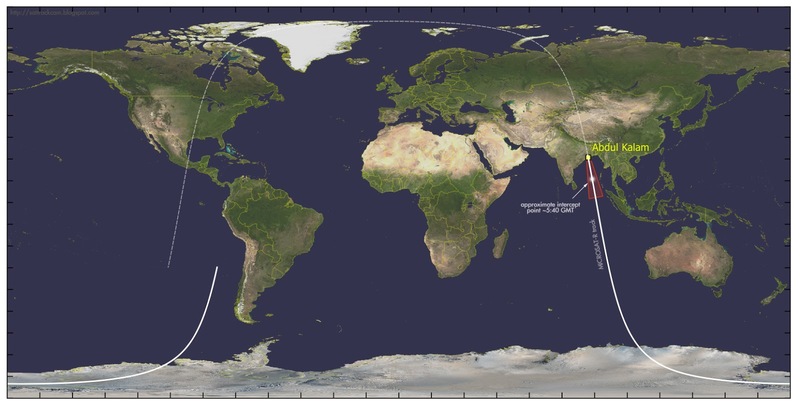 So, if NROL-71 is a new electro-optical reconnaissance satellite in the KH-11 series, it represents a serious deviation from past KH-11 missions. The apparent abandoning of a sun-synchronous polar orbit, is surprising, as such orbits are almost synonymous with Earth Reconnaissance. 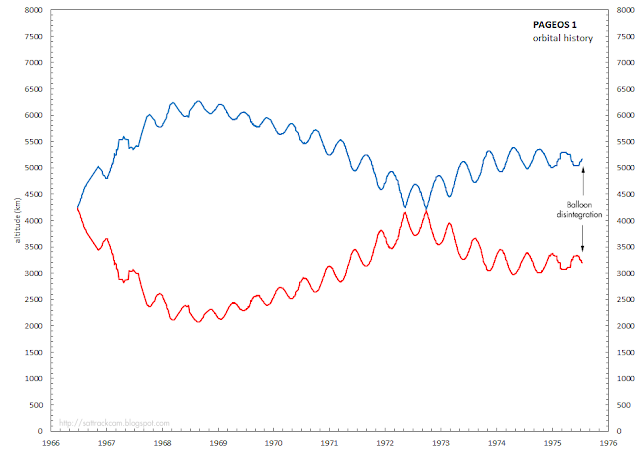 The "why" of a 74-degree orbit is mystifying too. If it does go into a 74-degree inclined orbit, it doesn't seem to be a "Multi-Sun-Synchonous-Orbit". Alternatives have been proposed. Ted Molczan has for example suggested that, perhaps, NROL-71 could be a reincarnation of the Misty stealth satellites, warning that the unexpected orbital inclination for NROL-71 might not be the only surprise. 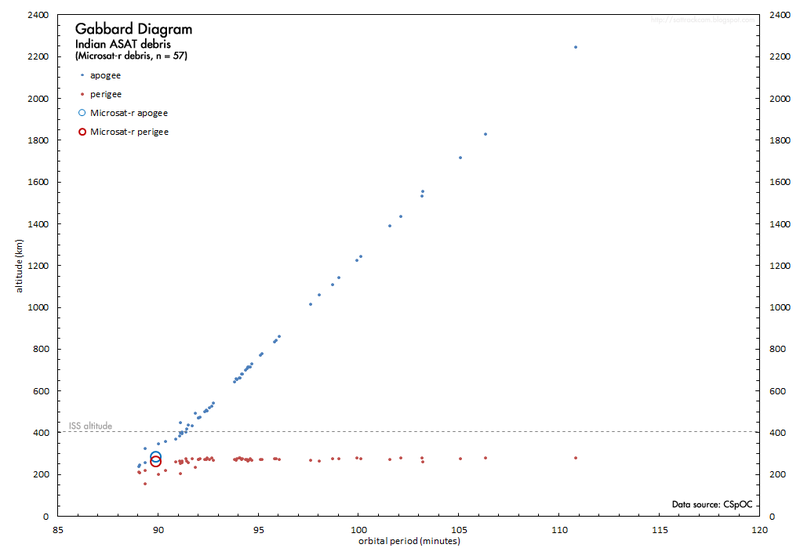 I myself was struck by the fact that 74-degree orbital inclination is the prograde complementary of the retrograde 106 degree inclination of the FIA Radar/TOPAZ 6 payload (USA 281, 2018-005A) launched early this year: note that 180-106 = 74. FIA Radar 6 was the first in a new block of TOPAZ radar payloads, just like NROL-71 appears to be the first in a new block of 'something'. 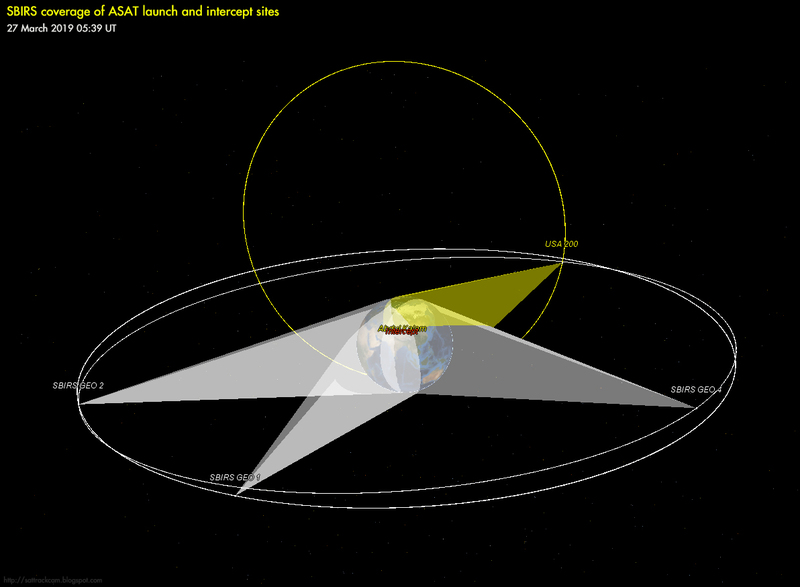 The previous four FIA Radars, launched into 123-degree inclined orbits, were the retrograde complementary in inclination of the prograde 57-degree Lacrosse 5 orbit, another radar satellite. The complementary character of 106-degree versus 74-degree for NROL-71, could perhaps point to NROL-71 being a Lacrosse Follow-On, as a complementary to the newest FIA block. 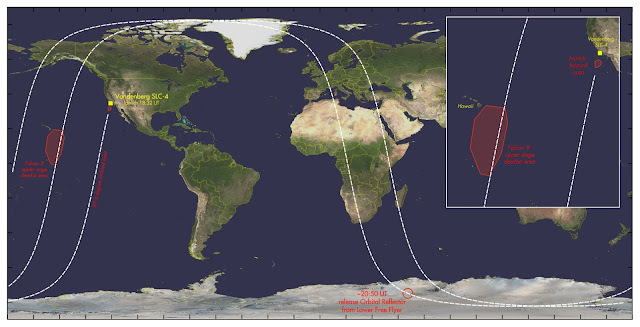 If NROL-71 is a Lacrosse Follow-On, its orbital altitude and brightness behavious might yield clues: Lacrosse 5 has shown a very distinct brightness behaviour. It will be very interesting to chase this launch. If launch occurs on 19 December near 1:57 UT and weather cooperates, Europe will have visible evening twilight passes in the first few days. 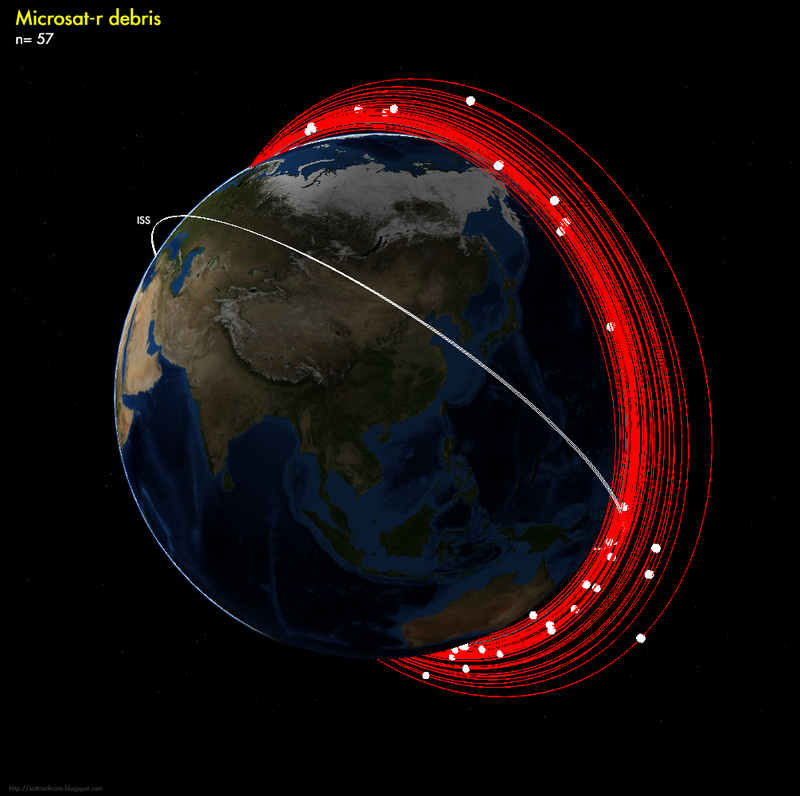 Below are a couple of search orbits. 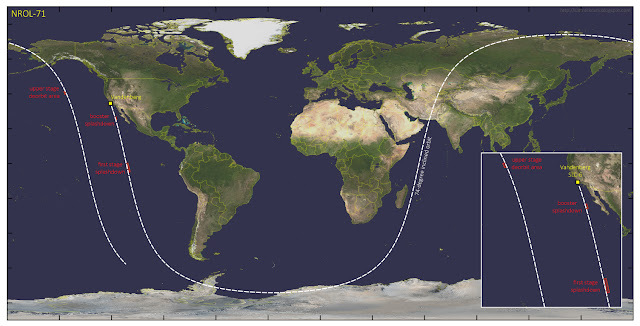 All are for an assumed 74-degree orbital inclination and launch on 19 December at 1:57 UT. The first three are for KH-11 like orbital altitudes. The fourth is for a Lacrosse-like orbital altitude. 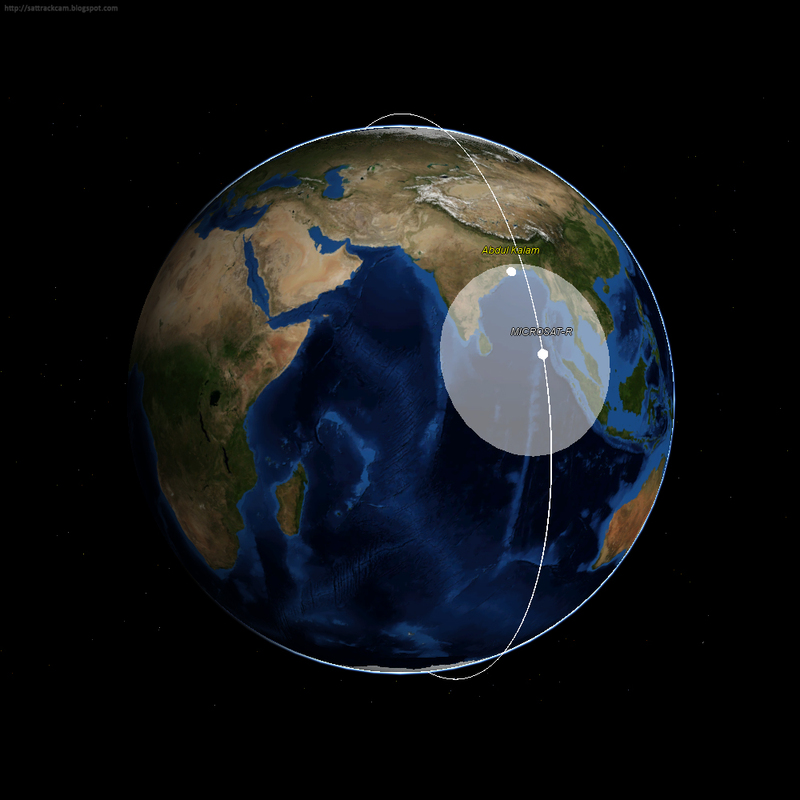 Orbit #70003 fits the hazard areas from the Maritime Broadcast Warnings best. Note that deviations of many minutes in pass time and several degrees deviation in cross-track are possible on all four orbits, certainly several revolutions after launch.